Namibia in south-west Africa is one of the driest and most sparsely populated countries on Earth. It is bounded by the South Atlantic Ocean on the west, Angola to the north, Botswana to the east and South Africa to the south. The Caprivi Strip, a narrow extension of land in the extreme north-east, connects it to Zambia. 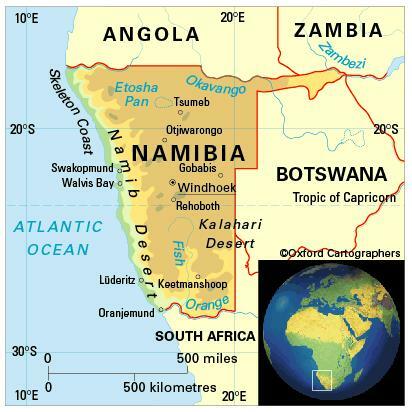 Namibia comprises 13 regions (from south to north): Karas, Hardap, Khomas, Erongo, Omaheke, Otjozondjupa, Kunene, Oshikoto, Okavango, Omusati, Oshana, Caprivi and Ohangwena. Arid, semi-arid and sub-humid. Prolonged periods of drought are characteristic. There is little precipitation apart from rare thunderstorms in the arid zone of the Namib Desert coast, with rainfall rising to 600 mm or more in the sub-humid northeastern border with Angola and the Caprivi Strip. Rain falls in summer (October to April). The cold Benguela current gives the Namib Desert thick coastal fog. The most significant environmental issues are the scarcity of natural freshwater resources and desertification. 2,259,000 (2012); density is extremely low overall, 39 per cent of people live in urban areas. The population growth rate stood at 2.1 per cent p.a. between the years of 1990 and 2012. In 2012 the birth rate was 26 per 1,000 people (43 in 1970) and life expectancy was 64 years (53 in 1970 and 62 in 1990). The Ovambo and Kavango together constitute about 60 per cent of the total population. Other groups are the Herero, Damara, Nama and the Caprivians. The San (Bushmen), who are among the world’s oldest surviving hunter-gatherers, have lived in this territory for more than 11,000 years. The ‘Basters’, who settled in Rehoboth in 1870, stem from marriages between white farmers and Khoi mothers in the Cape. The ‘Cape Coloureds’, immigrants from South Africa, tend to live in urban areas. f the white demographic of approximately 90,000, about 50 per cent are of South African and 25 per cent of German ancestry; about 20 per cent are Afrikaners (longer-established migrants); and a small minority are of UK ancestry. Namibia is classified as an upper-middle-income economy by the World Bank.